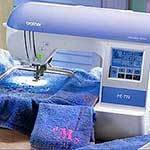 The Brother SE-400 has 67 built in stitches for various types of sewing, including 10 styles of 1-step buttonholes. The stitches include several styles of Straight, Zigzag, Overcasting, BlindHem, Applique, Stretch, Patchwork, Quilting, Eyelet, Smocking, Decorative, Heirloom stitches and Side Cutter stitches. Side Cutter stitches, using an optional side cutter foot, finish seams by overcasting and cutting off the extra seam allowance similar to what a serger does. 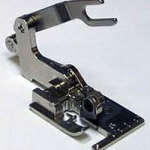 The stitch length is adjustable up to 5mm and the stitch width up to 7mm for some stitch patterns. Stitch attributes include: Mirror, twin, multi-directional, side cutter, satin stitch regulator. To select a stitch, use the arrow keys on the LCD touch screen to move through the stitch icons on the screen, select the stitch and choose the stitch settings. 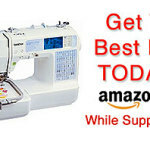 1 Straight stitch Basic stitching, sewing gathers or pintucks, etc. 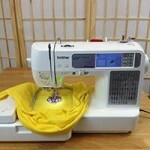 3 Straight stitch Attaching zippers, basic stitching, sewing gathers or pintucks, etc. 10 3-point zigzag stitch Overcasting on mediumweight or stretch fabrics, attaching elastic, darning, etc. 39 Decorative stitch Lace sewing, decorative hemming, heirloom stitching, etc. 40 Decorative stitch Decorative hemming, heirloom stitching, etc. 41 Decorative stitch Decorative hemming on thin, mediumweight and plain weave fabrics, heirloom stitching, etc. 42 Decorative stitch Decorative hemming on thin, mediumweight and plain weave fabrics, heirloom stitching, etc. 43 Decorative stitch Decorative hemming on thin, mediumweight and plain weave fabrics, heirloom stitching, etc. 44 Decorative stitch Decorative hemming on thin, mediumweight and plain weave fabrics, heirloom stitching, etc. 45 Decorative stitch Decorative hemming, ribbon threading, heirloom stitching, etc. 46 Decorative stitch Decorative stitching, smocking stitching, heirloom stitching, etc. 47 Decorative stitch Decorative stitching, smocking stitching, heirloom stitching, etc. Click here to See all the features of the Brother SE400.